1. Make a habit to brush your teeth at least twice a day, in the morning after breakfast and at night before bed. When sleeping, your mouth closed and causing no circulation of saliva, the bacteria will more breed. If there are more and more bacteria in the mouth, it will make damage your teeth and gums. Therefore, don't forget to brush your teeth before bed because it is very important to prevent tooth and gum problems getting worse. 2. 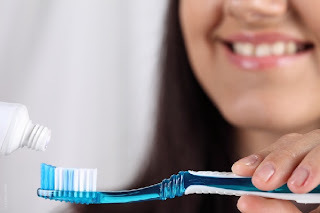 Choose a toothbrush that has soft bristles. Many people assume if you brush your teeth harder you will get clean results. This assumption is wrong because if you brush your teeth hard it will makes tooth enamel erosion. Get a new toothbrush when the bristles are blooming. You should place it in the bathroom with a cover or you might put in a cupboard behind the mirror in your bathroom in order to avoid contamination of germs and the bacteria. 3. Please do your best to brush your teeth. Brush your teeth from the gum towards the tooth tip. Do not forget to do flossing regularly. This will reduce the accumulation of plaque. 4. Use mouthwash every day. Using mouthwash helps eliminate the harmful bacteria in the mouth and helps prevent plaque. 5. Limit your sugar intake. Sugary foods and drinks can lead to tooth decay. 6. You should brush your teeth immediately after eating foods that are sweet and sticky. The remaining sweet food in the mouth that are not immediately cleared will be the main cause of cavities. Similarly, sticky foods, these foods should be cleaned in order not to accumulate and more difficult to clean later. 7. Drinking water will help flush the remaining food from the teeth thus helps keep teeth healthy. This is particularly useful if you do not have time to brush your teeth after eating. 8. Create a regular schedule to visit your dentist to check and clean your teeth.